For a long time, hubby had wanted to eat a spicy fish curry. I was scared as I can cook chicken very well, but fish.. umm.. I have no idea. But when I found this recipe, I felt like I can make it.. 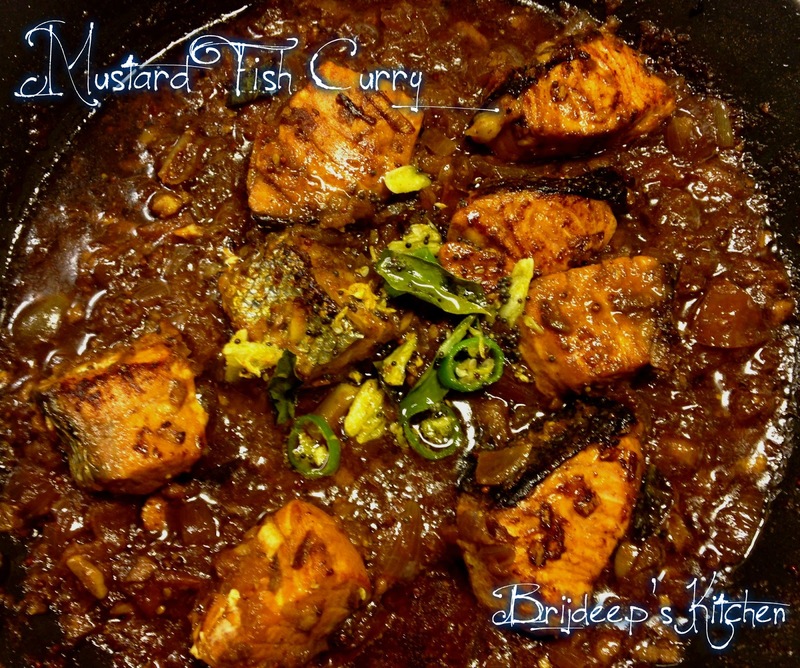 So hubby bought some Salmon fish and I prepared this curry. Yes, it took a lot of time and effort because it involves many steps but the end result was an awesome, flavorful, delicious curry which still makes my mouth water. I have tried this recipe so many times I have lost count and after the first time hubby tasted this, it was demanded again and again. 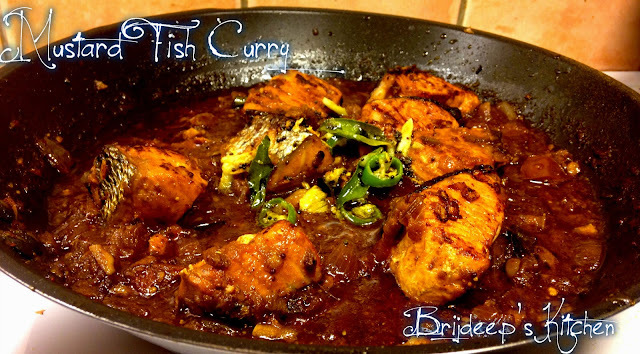 We have been eating fish curry with rice every Friday for dinner and this one is the most requested recipe on Fridays !! This recipe is inspired from here but with a lot of changes so not really sure of authenticity but well, here's how I prepare it. Ginger garlic paste (I prefer to grate): 4 tsp. Marinate the fish with the marinate ingredients and keep aside for 15-20 minutes. 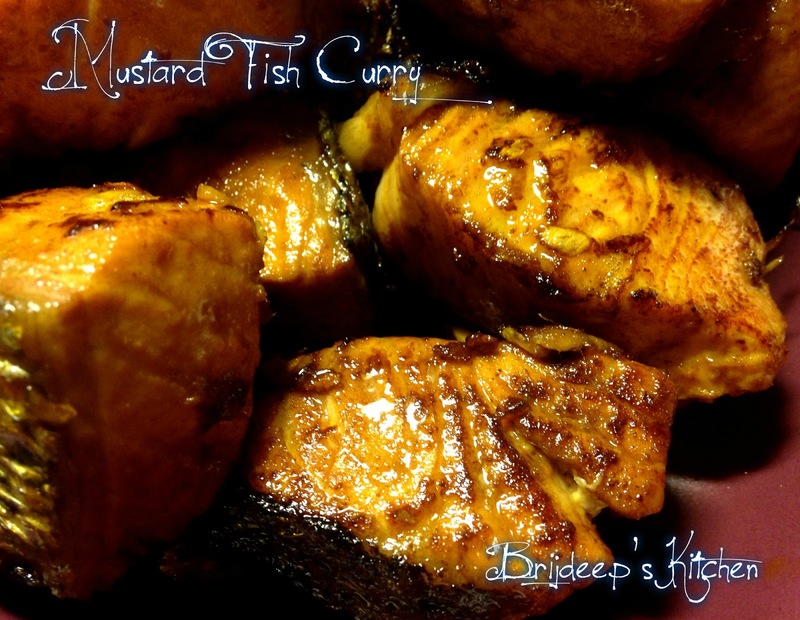 Heat mustard oil in a pan and when it becomes hot, gently add the marinated fish pieces to the oil one by one. The fish pieces will sizzle so be careful. Add any remaining marinade to the oil. Turn the fish pieces after 2 minutes, let cook on both sides till it becomes golden brown. Drain from oil and take out in a bowl, keep aside. This is how the fish looks when fried. Add mustard seeds to the oil and let them crackle; add the red chillis. Add curry leaves after half a minute. Add the chopped onions and fry until they become transparent. Add the ginger-garlic paste and mix well; fry until the raw smell goes away. Add the chopped tomatoes and mix well. Sprinkle little salt and let cook until the tomatoes become soft and mushy. Add the red chilli powder and give a stir. Add the tamarind paste and mix well. Add in about a cup of water (or more; depends on what is the desired consistency of curry) and mix well. Cover with a lid and let boil on medium flame until the curry is prepared and the masalas are blended completely. Remove the cover and add the fried fish pieces. 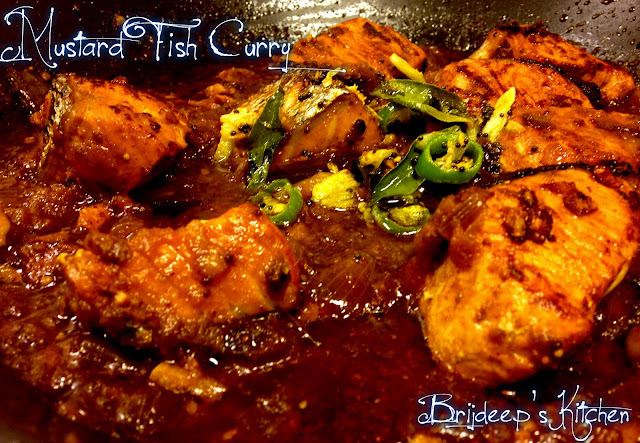 Mix carefully so as not to break the tender fish and turn off the flame after a minute. Cover and let sit for about 10 minutes, this will help the fish and the masalas to blend well together in the steam. In another pan, heat 1 tsp. oil. Add the crushed garlic, mustard seeds, green chilli and curry leaves. Fry for a minute and pour this tempering over the fish curry. Close the lid immediately and leave on for 10 minutes. Remove lid, serve hot with plain rice or jeera rice. Loved this recipe? Don't forget to leave a comment/feedback; join my Facebook Page and Pinterest for regular recipe updates. 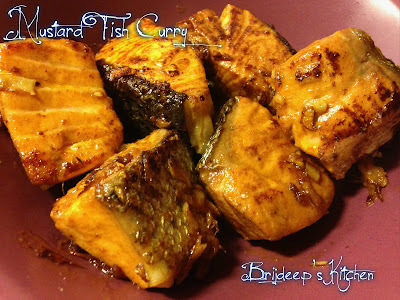 Looking for more Indian style recipes with Salmon fish? 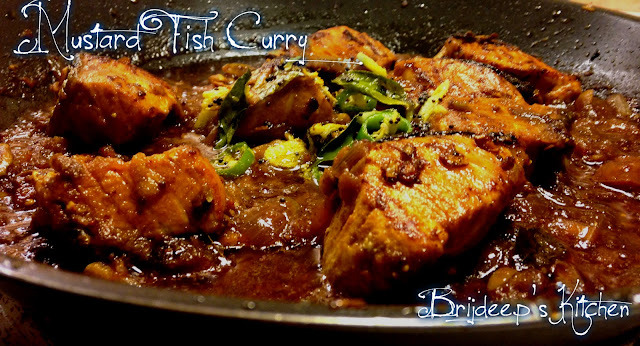 Try this Achaari Fish Masala, Lehsuni Fish Curry, Mint Fish Curry, Rustic Salmon Curry, Saffron Fish Curry and Malabar Fish Biryani.